or even business- this book holds the crucial keys to navigating these experiences with a deepened sense of compassion and understanding. If you take your time, and process the wisdom herein, your way of thinking, seeing, being and/or doing will be forever transformed! “Our World Market” is a legacy of the truths that Robert has discovered in business and in life. He shares these discoveries as a gift to those desiring to live and work in harmony and in peace – absent scarcity and suffering. What better application to these truths, than the diverse and successful Atlanta landmark, Your Dekalb Farmers Market, founded by Robert in 1977! relationships. Knowledge is freeing, when you see and apply new understanding to improve family and work relationships. His explanation of dual and opposite energy and how generations are distinguished is not only enlightening but fun to see in place within my own family and coworkers. In “Our World Market, The Generational Distinction,” Robert Blazer shares what he has learned from years of experience observing people and behavior and building a successful business heavily dependent on people working together. The information in this book, when applied to work or personal relationships, can have a profound impact on productivity, relationships with others, understanding of others and self, and general well-being. I found especially interesting the observations and explanations of people as either “expanding” or “contracting”. Like yin and yang, expanding and contracting people are complementary opposites. As the organizational structure at Your DeKalb Farmers Market demonstrates and as we have seen in our business, pairing expanding and contracting people together in the work place creates a team with balanced energy that capitalizes on the expanding person’s tendency to “think big” and the contracting person’s tendency to get the job done. Robert also shows how these differences affect family relationships. The book teaches how to identify these variations in people, how these distinctions affect workplace and family relationships, and how to use this information for personal and professional benefit. Thank you, Robert! connected by the generational distinction. Mothers and daughters are opposite energy and fathers and sons are opposite energy. Now, I can accept a person for who they are, rather than just as a male or as a female. Distinguishing each persons’ energy enables me to effectively communicate with them. Recognizing the generational distinction in my own family has made my relationship with my daughter clear. Since we are the same energy, I can give her the space to operate and function naturally and it allows me to listen to her and give her an opportunity to say what she needs to say and express her feelings. I’m not overprotective of her and I give her space to grow. I see the confidence that has built up from the understanding that we have. I enable others to contribute as well. Reading the book Our World Market: “The Generational Distinction” – Our Connection to Life, has been a life changing experience for me. From the moment I first started reading it in 2014, I began to have clarity about many of the events and circumstances I had experienced and observed in my everyday life. This book explains human behavior from an energetic lens, beyond that which is physical. It beautifully illustrates why it is that we often find discord in our lives, the primary mechanism for this discord being a lack of energetic balance and alignment. Once I started reading, the patterns became so obvious. There’s nothing incredibly complex about maintaining a balanced life (both internally and externally). As humans, we just make it difficult by not paying attention to what’s directly in front of us: The Generational Distinction. In the book, Mr. Blazer explains that everything in life is dual and opposite: (day/night, man/woman, up/down, sickness/health). We can’t know one without knowing the other. He posits that the same is true for us as humans. We are all comprised of energy, either expanding or contracting, to maintain balance in the universe. This same sense of balance must be maintained in our lives, through both personal and professional partnerships, for us to flourish and meet our fullest potential. Since 2014 I have revisited this book many times. I recommend that others revisit it frequently as well because as we grow and evolve, more meaning is gained from its content. Whenever I feel a shift coming in my life, I turn to the wisdom in the pages of this book. I know that the words will keep me grounded and remind me of that which I need to seek…energetic balance and alignment. I have found that once a person is aware of “The Generational Distinction”, it’s nearly impossible to turn off this awareness. I see it in everyone with whom I meet and interact. When I experience or observe a situation that is full of strife and discord, I can almost always pinpoint where the lack of balance has originated or where it currently resides. Even as an empirical, cognitive developmental scientist, I feel no dissonance between that which I know scientifically, and the enlightenment that is presented in this book. Similarly, it’s not about religion, nor is it in discord with religion. This book is truly about two naturally occurring phenomenon in our universe: energy and balance. It’s about understanding ourselves through our interdependence to, and relationships with others. It’s about the collective being greater and more effective than any individual part. It’s about recognizing that we can only begin to understand what is, through understanding what isn’t…and for this reason knowing that we will all find ourselves in unbalanced situations at one point or another. The goal is to be able to recognize the unbalance (that which isn’t what we desire), so that we can be more intentional creators of balance in our lives (that which we do desire). Through this iterative process of becoming more intentional and deliberate creators of balanced lives, we begin to feel and experience a new sense of peace, internal comfort, and prosperity. I have personally come to a place in which I’m no longer willing to live any part of my life out of balance. This book makes it incredibly clear that we’re the only ones who can get in our own way of living the lives we wish to live. The universe was designed to work, and we just have to allow it to do so. Robert Blazer has written this all encompassing book dedicated to the transformation of the individual, the group, and even the world as a whole. It is for the students of life, who stand at the crossroads, at the place where two paths diverge. One is the path of the individual, a well worn path indeed. The mundane path of ego, materialism, scarcity, disconnect, and suffering. Where no one takes any responsibility for the way things are. The continuous perpetuation of the downward spiral of humanity. The other path is of the Generational Distinction. It stands alone as a way of understanding the complexities of human interactions, as it relates to the pair and group dynamic. It also offers self discovery and mastery, in Robert’s explanation of the inherited world view. The book offers relief in how to free oneself of this world view, through simple understanding. These concepts have been proven to work in the Dekalb Farmers Market, and my life as well. The information, in this book, must not only be read and understood, but internalized. I would like to thank Robert and Barbara Blazer for helping me on my path to this internalization. They are two of the kindest, intelligent people I have ever had the pleasure of knowing. This book, and their efforts, have been instrumental in turning my life around. It has meant so much to me and my family. I am eternally grateful. As a vendor representative calling on the market buyer one afternoon, I noticed a book written by owner, Robert Blazer of the best fresh produce market in the country, “Your Dekalb Farmers Market’. Intrigued, I instinctively bought a copy. As I began reading, I was happier having the new ‘knowledge’ that I gained through those pages. The book does a wonderful job explaining the basic distinction between an ‘expanding’ and and a ‘contracting’ energy person and how those relationships can be balanced, so that at every level of existence we can live in a happy, full and scarcity free world. In the book, Robert is so convincing, while he stresses that three generations working together brings forth total well-being. “Our World Market, The Generational Distinction” is a must read for anyone that cares about relationships at any level with anyone and everyone. organized like myself. He forgets many things and that makes me very upset. Without this distinction, I would be upset and angry with them everyday. Now since I know who they are, I have a better understanding of them. I also get many different ideas from my daughters that I would never have thought of before. energy distinction. I am contracting. Before I figured out my energy, I was always opposing new ideas not related to my experience. My husband and three daughters are expanding energies which is opposite me and I understand them better than before. Similarly, at work, the ability to work in an environment of partnerships is very effective for me. Collaborating with an opposite energy partner helps me to be balanced. I do not feel as if I am responsible for the entire task to solve on my own. I am more confident being with my partner, supporting each other to accomplish our task effectively. I have come to understand that the organizational structure is also set on three levels, i.e. player, lead player, and coach. Every level of the structure is based on requesting support. Each level is responsible for responding to requests for support properly. When my wife and I moved to Dekalb, we stumbled upon a place called Your Dekalb Farmer’s Market, a place unlike anywhere we had ever been before, with hundreds of cultures coming together for good food. We later found the Manifesto that guided the store, “Our World Market, The Generational Distinction”. The book itself is a conservative proclamation that the World is inherently good, filled with expanding and contracting energies. Discordance regarding these energies can lead to strife and scarcity; whereas being in a balance with the energies allows hard work to be accomplished and genuine complementarity to flourish. Our lives have been changed for the better by this store and this book; we are better able to balance the way we eat and the way we communicate, and our understanding of the world around us. One only has to walk into the store and immediately feel the balance of energies that flow directly from the book and the lessons thereof. I am an expanding person. I am married to a contracting man and have two daughters who are contracting. Before knowing the energy distinction, I had difficulties understanding them. But after understanding the generational distinction, I now understand my husband, my kids and myself very well. difference in my family as well as in my life. In the workplace, working in a balanced partnership makes the difference. 1. Helped me to listen to my husband’s point of view, accept it as valid, even when I disagree. 3. Enabled me to trust that our children are making the best choices for themselves, and interject my point o view only when invited. 4. Has helped me become a calmer person and get off the defense when my husband expresses an opinion that is different to mine. 5. I am learning to “get off it!” And boy, isn’t that freeing! After learning “the energy distinction” I see myself as a contracting energy, time creating person, doing what I can do to be who I can be. I know that by myself I can’t see everything that is going on. I need my opposite energy partner to see what’s going on as well. Together we see the whole picture. accomplish a lot of things. Together we are able to see and do things in a better way. working together we develop and grow together. We learn and teach every day. not blaming or pointing the finger at each other. I know my husband is expanding so I don’t expect him to be the same as me. This understanding makes our relationship stronger. Before, I only believed in human beings as male and female. Now I see from the generational distinction in the book that people have opposite energy: mothers and daughters are opposite energy and fathers and sons are opposite energy. This means that both genders can be either expanding or contracting. I also believe that the world is really designed to work. I see that by working together with my partner who is opposite my energy. I can create an idea for a project as an expanding energy person and my partner will work on completing the project as a contracting energy person. Finally, together we can contribute different things to our work. Before I understood the generational distinction, we used to blame each other by not understanding each other. Now I understand who they are and who I am. There is no more blaming each other. I see balance in my own family because I have a son and a daughter. My daughter acts the same as I act because we are the same energy and my son acts the same as his mother because they are the same energy. I understand them better because of the generational distinction. Knowing the energy distinction as an expanding energy person make me understand myself better. As a space provider, I am coming from nothing to create something which is missing. After knowing the distinction that mothers and daughters are opposite energy and fathers and sons are opposite energy, my family life has changed and become stronger. By knowing my son is the same energy as me, and my daughter’s energy is opposite me, we now have a different relationship, not blaming each other for the way we are, understanding each other better and creating a more peaceful family life. With my husband of 31 years, my relationship is better after knowing he is a contracting energy person. He likes things to be the same all the time and he is a timely person. communication is useful in problem solving and achieving good results. responsibility for things which we can accomplish together, creating strong relationships like family members. Good partnerships create space for growing in business and as a human being. I have been aware of the information in Robert Blazer’s book – Our World Market, The Generational Distinction, Our Connection to Life – since 2003. For me, personally, understanding the distinction and putting into practice some of the behaviors that come naturally after taking it to heart have had a profound effect on my life and my relationships both in and outside of my family. Additionally, I have been witness to breakthrough results in lives of some of the others who I have shared the information with. This testimonial hardly goes over every aspect of the contents of the book but I have tried to share some of the highlights that have come about in my life since learning about The Generational Distinction. Robert’s and my ongoing conversation about the Generational Distinction began in 2003 when he was kind enough to share with me how he and his wife Barbara were able to manage their remarkable business without multiple tiers of management or the kind of internal bureaucracy you might expect in an organization like Your Dekalb Farmers Market. The more I learned, the more interested I became. The more I asked, the more he shared and it wasn’t long before he and Barbara together explained the seemingly impossible simplicity of the Generational Distinction that is at the root of the market’s astounding success. At the time, I had been working for my father for many years and we had a less-than-ideal relationship. He couldn’t understand why I couldn’t be like him and neither could I. I couldn’t understand why nothing I did ever seemed to be enough, even when I delivered strong results. After learning about The Generational Distinction and fundamentally changing how I interacted with my father, things became much better almost immediately. Many of my problems at work simply seemed to resolve themselves and my dad and I went on to do some great things together in the years that followed. Today, he is my best friend. For the first time in my life I began to operate from a place where I believed in my heart that life wasn’t designed to “take me out”. In large part, because of the freedom that came from the information that is now in this book, I have been able to completely recontextualize my life. I am now living my life as it is meant to be lived. With me, a multigenerational cycle of misunderstanding has come to an end. I do what I love and I have a wonderful wife and two great kids. All during these years, I have been mindful of collaborations and partnerships that I have been involved in and keeping balanced energy. And because I now understand what and how I can best contribute in terms of my individual talents and skills I am never running blind any more. I am expanding. My wife is contracting. She and I were acquainted for several years before we dated, and then we dated for two years. I have known her mother and step-father just as long. My wife was and still is her (biological) daddy’s princess and her mother was always criticizing her about everything. She literally spent the first thirty years of her life thinking something was wrong with her because of this. Her relationship with her mother was strained at best. She loved her mom with all her heart but every time they would spend time together she (my wife) would walk away feeling inadequate or even depressed. By her simply changing how she interacts with her mother there has been a remarkable shift in their relationship, and even though it’s not perfect, they have a much deeper understanding of each other and now their time together is meaningful and joyous. I am very glad that the Generational Distinction is finally in a book. Even though the basic information is relatively simple and intuitive if you are open to it, there is quite a lot to it once you start to go deeper. I have shared The Generational Distinction with many people over the years since I first learned about it. Some people have been more open to it than others and in nearly every case they tend to catch on once we start talking about their families and people they know and their families and so on. The thing is, even though it’s in a book, it’s still best to have a conversation, so it should be read with someone. This should be of no surprise, though, because the main idea of the book is that our lives are meant to be experienced in partnerships. We are not capable of seeing the whole picture (of any situation) as individuals so how can we be expected to process the information in this book alone and then pass it on. My wife and I have been reading it together. Probably our most memorable read was when our new daughter was born in September of this year we read part three in the hospital room. I look at the information that Robert and Barbara gave to me and my family (and that is now in this book) as heirloom knowledge. I will pass it to my children as soon as they can understand and their lives will be exponentially better in terms of finding their way than mine or their mother’s. It is my hope that they will pass it on as well. 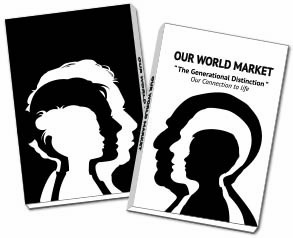 In September 2014 my wife and I received a copy of the book: Our World Market “The Generational Distinction” Our Connection to Life. We agreed to take turns reading, chapter by chapter, and then discuss its content together. However, it was only after re-reading chapter I together that we were able to see ourselves as energy and how this energy expresses itself in human being as either expanding energy, or contracting energy. Reading together as a couple helped us see which opposite energies we were. It also helped us see our son and me, as opposite energies, and our daughter and her mother as opposite energies. On further reading, we were able to see how the generational distinction-our connection to life allows us to interact with each other relatively unencumbered by emotional, psychological, social and spiritual entanglements. The information in this book has supported our marriage by providing a bridge of understanding that has put us on the path to eliminating scarcity and suffering in our lives. Robert Blazer, thanks for allowing me to share, if only briefly, how Another Way of Seeing Ourselves (Chapter I) has impacted the world we are living in today to the world we are designed to live in. Copyright © 2014 DeKalb Farmers Market, Inc.